Obtain an FAA Medical Certificate. Log at least 40 hours of flight training. 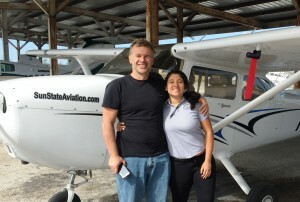 Receive at least 20 hours of flight training from an authorized flight instructor. Log at least 10 hours of solo flight time. Pass the required knowledge test. Pass a Practical Test consisting of both an oral examination and a flight test. Our Accelerated Private Pilot License course can be completed from scratch in as little as 21 days!